You are currently browsing the category archive for the ‘Rural workforce’ category. While the median ages are the same (52 years) in 2012 for rural and urban physicians, it is interesting to note that the average or mean ages for rural and urban physicians were higher than the median ages in 2006, emphasizing the older ages in both areas. However, by 2012, the average or mean age for urban physicians (51.4 years) was lower than the median age (52 years), emphasizing the younger ages among urban physicians. At the very least, they can initiate policies to target state funding of medical teaching programs to institutions focusing on primary care training and provide greater financial support (as through loan forgiveness) to physicians who specialize in primary care. They also can encourage or mandate lower payments to specialists for patient visits NOT made by referral from a primary care practitioner. Additionally, they can increase reimbursement rates to providers who demonstrate that they deliver primary care in ways to achieve its benefits; instruments are available to document the primary care orientation of practices. I was asked to speak to the pre-med honors society at the University of Alabama about the new health care law (either the Affordable Care Act or ObamaCare depending on your preferred news channel) but that is a story for another day. On the way back to Mobile, being untroubled by an Interstate highway in that part of the state, we decided to take the (way) back roads to eat lunch at an out of the way “fish camp.” While sitting down at Ezell’s Fish Camp (“The Holy Grail and standard bearer of catfish camps.”) in Laveda Alabama I spy a person walking in with what is clearly a medical office staff who I think I recognize. It turns out that it was Bernita Mims, MD who graduated from our residency and is now working in Butler. It is a very small state! I later was speaking to the waitress and she reminded me that Karen Manning, MD, a family physician who is one of our community faculty, has an office in Toxey, Alabama (Population 152). As we were driving through Toxey anyway, I stopped by to say hello. Dr Manning has an Rural Health Clinic which she shares with a Nurse Practitioner. I had a long conversation with her a couple of years ago where (as she recalls) I encouraged her to set up the practice and break away from the hospital system that was supporting her at the time. I was able to tour her new office and was impressed by the efficiency of the design, the effectiveness of the staff, and the ability of the office to bring medical care including lab, x-ray, and now ultrasound to a very rural part of the state. I was also impressed by the built-in child care arrangement that facilitates employee attendance and I’m sure accounts for the high employee morale. As I finished my drive through rural Alabama and hit other towns where we have placed physicians, I was reminded of why I went into academic medicine. As a physician I can only reach so many people but as an academician I can extend that reach. Although we still have profound shortages in this state, at least we as a department are doing our part. Between 1996 and 2006, the general pediatrician and family physician workforces expanded by 51% and 35%, respectively, whereas the child population increased by only 9%. The 2006 per-capita supply varied by >600% across local primary care markets. Nearly 15 million children (20% of the US child population) lived in local markets with <710 children per child physician (average of 141 child physicians per 100 000 children), whereas another 15 million lived in areas with >4400 children per child physician (average of 22 child physicians per 100 000 children). In addition, almost 1 million children lived in areas with no local child physician. Nearly all 50 states had evidence of similar extremes of physician maldistribution. In Alabama the market works just as you would expect. In urban areas where physicians who see a high volume low acuity practice can make a good living, there are a lot of physicians. In rural areas it almost certainly won’t happen, and this is a consequence of our current payment structure (discussed here and here). In Alabama where 45% of all births are funded through Medicaid, not changing Medicaid means not improving the system. The system is perfectly designed to achieve the results it achieves. Letting more people from urban areas into our medical schools (as we’ve done with the class expansions at USA and UAB) to turn out more docs in hopes that they will move into rural areas by bribing them with loan repayment or threatening them with inability to make a living in urban areas will not work, either. It turns out that physicians can generate their own business regardless of the “need” under the currently structured system and patients will play along (need an imaging study? Additional labs? An operation?) as discussed here and here. The combination of lifestyle and need to generate volume will ensure a continued maldistribution in Alabama under the current payment structure for the next 20 years. In 1956 Kerr White published a study of how healthcare money was spent entitled the “ecology of medicine” which was updated in 2001 by Larry Greene. If such a study were done in Alabama it would be interesting to see what our citizens get for the money. I only hope Governor Bentley understands this. Although money makes everything better (or allows for the purchase of better antidepressants), even if we altered the payment structure we will not get happy, fulfilled docs in rural Alabama. The other aspects of the infrastructure needed (discussed here, here, and here) are adequate professional support, availability of technology, access to tertiary care,and a team based approach that includes non-physician providers. Particularly, to care for children requires accessibility for the patients as well as physician accessibility to information and tertiary care. The status quo has resulted in a primary care workforce for children that has grown tremendously without elimination of major variations in primary care supply. As demonstrated by the dramatic variation in local child physician supplies across the United States in the face of robust expansion in the child physician workforce, current calls for expansion in medical schools and lifting of the graduate medical education cap should be viewed critically. Unless expansion is targeted explicitly toward serving populations with the greatest needs, it may lead to greater health care inequities, with little improvement in the quality or outcomes of care. Accountability for the public funds that support medical training should start with concerted, transparent efforts to develop, to use, and to evaluate policies aimed at reducing disparities in geographic access to care caused by extremes of physician maldistribution. With this conclusion I heartily agree. How do we get Docs into rural Alabama? I recently gave a “State of the Department” report to the Executive Committee of the College of Medicine. 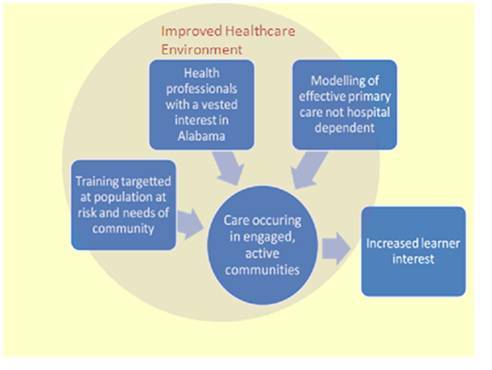 I took over as Chair in 2005 and have attempted to create a training environment that would facilitate entry of students into a primary care practice with a focus on rural and underserved Alabama. The template we are working off of is above. We’ve not done very well in the 4 years since I became Chair. Only 5% of the students have gone into Family Mediicne and those going into Internal Medicine and Pediatrics have mostly left the state. In the course of the discussion, the non-Family Physician faculty became very defensive and felt that they should not be asked to take responsibility for an outcome that they were unable to influence. In addition, they felt that test scores were an outcome that they should be able to influence and rural students would have trouble keeping up with our current students. 1) It is incredibly important to develop a health careers infrastructure at the K-12 level on a state wide basis. Many counties are only likely to have physicians return if they were born or spent a significant amount of time in that county. In most of these programs, the children who are trained may take advantage of the opportunity to leave so the programs have to train above need and replacement to take that into account. IN Alabama, we currently have less than 100 students engaged in programs such as this annually. 2) Once rural students and students interested in caring for the underserved are enrolled in medical school, there needs to be predictable funding for the medical school infrastructure at UAB, USA, and possibly AMEC to offer instruction and support in rural and underserved medicine. The current funding strategies in medical education are neither sufficient nor predictable enough to in its current iteration accomplish this. 3) We do not have adequate Family Medicine residencies in Alabama to replace physicians who are retiring, much less address the shortage. These positions should be increased independently of other health manpower activities as residencies predictably place graduates near the program “hub”. My friend Josh Freeman and I have had an ongoing discussion over the last 15 years regarding the (un)design of our health system and the fact that every system is designed to get the results it achieves. Based on our results, the current design “bites the wax tadpole” as the Chinese say. Josh has calls for the complete redesign of the system. I tend to agree with Johnathan Cohn in “The New Republic” that one of the things that killed the last effort at serious reform was the fear of the overwhelming that threatening to retool one sixth of the economy all at once invariably brings. I tend to look at HR 3200 as being a little over half a loaf. as does the National Rural Health Association. It is not perfect. It does not going to go far enough to correct payment inequities that lead to students to select training to become “partialists” rather than primary care specialists. What it does include is increased money to assist with training of generalist physicians and important fixes to the system of paying for this training and increased money for the National Health Service Corps. It also includes some (but still not enough) money to establish the “Medical Home” as a method of care delivery. It could include more on mental health and rural trauma as well but all in all, not a bad start. Now lets see what happens as the sausage gets packed in the skin. 2) Strengthen the primary care infrastructure and reward coordinated, collaborative care DIRECTED by the primary care physician. We now have enough data to know that people do better and care is cheaper if they have a medical home, if that medical home has the electronic capability to allow prospective recommendations regarding preventive and chronic disease care, and the specialty care is coordinated through the primary medical home. Although many people believe they can coordinate their own care, the evidence is that this is expensive and leads to poor patient outcomes. Additionally, the reimbursement system needs to be restructured away from rewarding episodic “procedural” care towards this type of care management. Lastly, the vast cost of care for a given person is incurred in their last months of life. A medical home can allow patients to have access to an “honest broker” who might be able to reduce these costs through timely hospice referral and effective palliation. The proposals that pay for this through management fees seem to make the most sense to me. Creating this type of payment system would encourage practices to move from an urgent care model (many providers have left private practice in rural Alabama and moved into urgent care type practices) to a model where primary care in rural areas is adequately rewarded. These practices could offer urgent care as a part of the “basket of services” but would not necessarily need the full and costly infrastructure of the hospital. 3) Training of primary care physicians (family physicians, internists, pediatricians) needs to be revamped and adequately funded. Current funding mechanism through Medicare is based on a model of care from the 1960s when training was based on an apprentice model and the poor were the substrate upon which physicians trained. Primary care training should not be primarily hospital based. Additionally, trying to teach learners (premed students, medical students, and residents) primary care is difficult work. Training programs need funding for instructors above what the supervised learners can generate through supervised patient care. HRSA Title VII has been an historic mechanism through which to do this and it is up for reauthorization this year but it may be that the entire method of paying for medical education should be revamped. In Alabama the problem is even more acute as we are a net exporter of physicians and our primary care workforce is rapidly nearing retirement age. Physician assistants and nurse practitioners are important providers of healthcare as well but people want physician directed care. 4) Transformational change must occur which includes universal coverage and movement towards a primary care based system. Attempts at incremental change will lead to failure. Funding concerns, while important, should take into account the current situation and anticipated savings. Paul Grundy, Vice President for Healthcare at IBM http://www.pcpcc.net/content/paul-grundy is going around the country with a slide show demonstrating how poor the cost/quality ratio is in this country as opposed to other countries as well as how IBM is not creating jobs in this country as a consequence. Up until very recently, healthcare was seen as “an important part of the American economic engine”. I think now we see it is more of a support service which helps us to have a productive economy and that wasteful healthcare spending hurts us all. In Alabama, Medicaid and Blue Cross (included the Medicare plans they administer) cover over 80% of the population. If they can be convinced to embrace such change, it will happen.